PM #40762529 $5.00 • Vol. 29, No. 30 September 24, 2018 L AW TIMES C O V E R I N G O N T A R I O ' S L E G A L S C E N E • W W W . L A W T I M E S N E W S . C O M Ruling could affect thousands of wills Pia Hundal says there are 'a number of established and very well-respected estate planning lawyers in Ontario' concerned by a recent ruling. Photo: Robin Kuniski POLICE REBUKED Detention of drug suspects criticized P5 MENTAL ILLNESS More than legal careers at stake P7 FOCUS ON Immigration Law P8 BY ANITA BALAKRISHNAN Law Times A judge with the Ontario Superior Court of Jus- tice decided the validity of two nearly identical wills this month, finding that one of the wills was invalid because in leaving the assets to the discretion of the trustees it failed to "describe with certainty" any property that is subject to the will. Lawyers say the decision could possibly nullify wills across the province, even those drafted by the province's most esteemed law- yers. The case centres on the basket clause, a way of drafting multiple wills to enable the trustees to de- termine what assets fall into either will, rather than enumerating each asset in one of the wills. Basket clauses are used in cases of multiple wills accepted for pro- bate since 1998, says Pia Hundal, a partner at Dentons Canada LLP and chairwoman of the Ontario Bar Association's Trusts and Es- tates Law section. "This is the first time, to the best of my knowledge, that the basket clause has been tested in a written decision of the court," says Hundal, who was not involved in the case. "I know for sure there are a number of established and very well-respected estate planning lawyers in Ontario that do use bas- ket clauses and are very concerned right now." Hundal says that, prior to the decision, the estate planning bar in Ontario was split on whether or not to use basket clauses because they hadn't really been tested yet in the sense that there hadn't been a case where the judge looked at the validity of the basket clause. The Sept. 11 decision, Milne Estate (Re), 2018 ONSC 4174, was argued by WeirFoulds LLP lawyer Clare Burns and Anastasija Suma- kova, formerly of WeirFoulds LLP, before Justice Sean Dunphy in To- ronto. The case revolves around a couple, the Milnes, who died in October 2017 and left their daugh- ter, accountant and lawyer as ex- ecutors of the estate. There were two wills for each of the deceased, a primary will and secondary will, which Dunphy called "materi- ally identical" save for specific lan- guage. 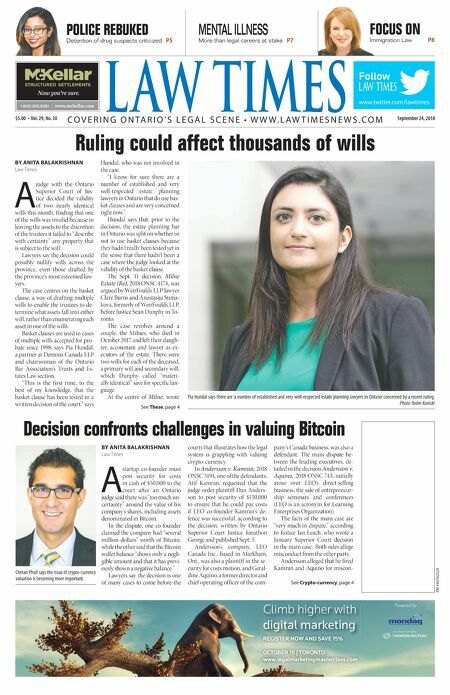 At the centre of Milne, wrote See These, page 4 Decision confronts challenges in valuing Bitcoin BY ANITA BALAKRISHNAN Law Times A startup co-founder must post security for costs in cash of $50,000 to the court after an Ontario judge said there was "too much un- certainty" around the value of his company's shares, including assets denominated in Bitcoin. In the dispute, one co-founder claimed the company had "several million dollars" worth of Bitcoin, while the other said that the Bitcoin wallet balance "shows only a negli- gible amount and that it has previ- ously shown a negative balance." Lawyers say the decision is one of many cases to come before the courts that illustrates how the legal system is grappling with valuing crypto-currency. In Andersson v. Kamran, 2018 ONSC 5191, one of the defendants, Atif Kamran, requested that the judge order plaintiff Dan Anders- son to post security of $150,000 to ensure that he could pay costs if LEO co-founder Kamran's de- fence was successful, according to the decision, written by Ontario Superior Court Justice Jonathon George and published Sept. 5. Andersson's company, LEO Canada Inc., based in Markham, Ont., was also a plaintiff in the se- curity for costs motion, and Geral- dine Aquino, a former director and chief operating officer of the com- pany's Canada business, was also a defendant. The main dispute be- tween the feuding executives, de- tailed in the decision Andersson v. Aquino, 2018 ONSC 743, initially arose over LEO's direct-selling business, the sale of entrepreneur- ship seminars and conferences (LEO is an acronym for Learning Enterprises Organization). The facts of the main case are "very much in dispute," according to Justice Ian Leach, who wrote a January Superior Court decision in the main case. Both sides allege misconduct from the other party. Andersson alleged that he fired Kamran and Aquino for miscon- See Crypto-currency, page 4 www.twitter.com/lawtimes Follow & $#&!&jmmm$cYa[bbWh$Yec ntitled-4 1 12-03-20 10:44 AM Powered by REGISTER NOW AND SAVE 15% OCTOBER 15 | TORONTO www.legalmarketingmasterclass.com Climb higher with digital marketing Mondaq_LT_Sep24_18.indd 1 2018-09-19 12:27 PM Chetan Phull says the issue of crypto-currency valuation is becoming more important.